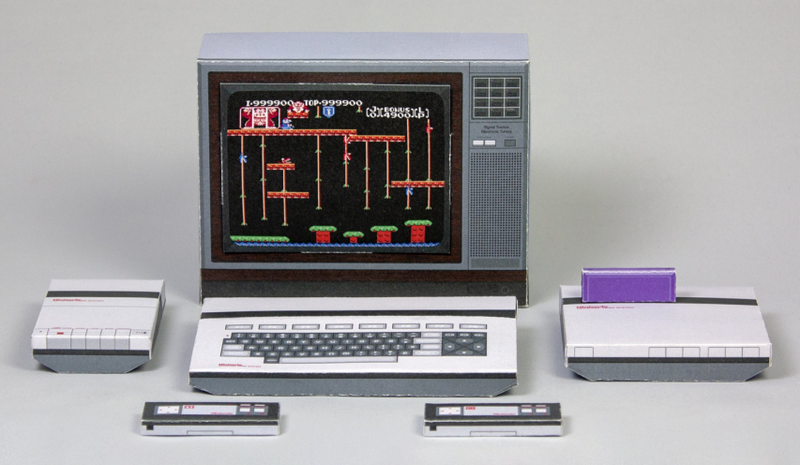 The Nintendo AVS (1985 Prototype), recreated in papercraft #Nintendo #VintageComputing #RetroComputing @rockasoo « Adafruit Industries – Makers, hackers, artists, designers and engineers! It’s hard to imagine a time when Nintendo was not a household name but in 1985 the company was widely unknown to western audiences. The Nintendo Famicom had released in Japan almost two years earlier and took the country by storm. Looking to expand their successes in other markets Nintendo was looking to partner with a company to develop a Famicom for the west. Nintendo had initially teamed up with gaming-giant Atari in 1984 to help develop and market the Nintendo’s console. Atari was not convinced that Nintendo could succeed and used this agreement to stall Nintendo’s 8-bit development in North America while secretly developing their own “next-generation” 8-bit console, the 7800. Nintendo, desperate to find distribution partners, took their prototype to the 1985 Consumer Electronics Show (CES) in Las Vegas. This prototype was called the Nintendo Advanced Video System or AVS. Nintendo marketed the AVS as an evolution in the gaming industry making reference to the laws of survival in the animal kingdom in their promotional materials. The AVS promised graphics that would appear three-dimensional, challenging gameplay and a system designed to fit in with existing hi-fi equipment. This system was no mere plaything – this was serious business. See more about the AVS at RockyBergen.com and while there check out the other designs.